Overview of how engagement fits into the City’s planning and development application processes. Public engagement is an important part of the planning and development process at the City of Edmonton. Planners who manage these applications think critically about how best to involve people in the process of reviewing them. These types of applications include new and changing neighbourhood plans, zoning bylaw changes, development permit applications, and road closure applications. The City has spent the last 18 months identifying positive changes we can make to help citizens tell us what you think about planning applications. We believe we have made good progress - here are a few things that we’ve done. City Council approved a new Public Engagement Policy on April 11, 2017. In general, the City uses the new policy to help us in planning how to involve people in decisions that may affect them. We are creating and updating webpages for all new planning applications, to help you find the information you need. They are organized by neighbourhood, and include application details, events planned for the public, updates, and how to contact the planner that is managing the application. We updated our public notifications, making them into easier-to-understand postcards. Key contact information and event details (when applicable) are easy to find. On some major planning applications we have been hosting meetings earlier on in the process and also having follow-up information sessions. In 2016, we began piloting new types of meeting formats to encourage more people to attend and to offer a variety of ways for people to learn more and talk together. We will continue to think about and try new ways to support having your say. City Council approves new neighbourhood and area plans, rezonings, and some road closures, as well changes to existing plans. Provincial legislation (the Municipal Government Act) requires Council to have a public hearing before approving them and any person interested in an application can speak at these hearings. Sustainable Development gives interested residents opportunities to receive information and provide input earlier, because public hearings occur late in the planning process. When planners in Sustainable Development receive an application, they mail notification postcards to property owners in the area and to the affected community league(s) and business association(s). Planners get more information about the application and can include an initial technical review. Planners will sometimes hold a public information and feedback event and might take other steps to ask the public what it thinks about the application while they review it based on City policy, guiding legislation and professional standards. To let Council know the opinions of residents before they make their decision. After any engagement and the technical review, the planners provide a recommendation of support or nonsupport as part of a report to Council. City Council, as the elected decision makers, then factor in public perspectives as makes sense to them. The development permitting process is how the City ensures that buildings or other uses conform to the property’s zoning under the City’s Zoning Bylaw. The application is for a land use that is "permitted" under the current zoning and conforms exactly to all of the zone's regulations. A City development planner is obligated by the Municipal Government Act to approve the application (Part 17, Sec 642(1)). The application is for a "discretionary" land use or requires a variance (exception) to one or more of the current zoning regulations. If the development planner approves an application like that, notification letters go out to adjacent property owners and the affected Community League(s) and Business Association(s). Anyone who feels affected by an approval has the right to appeal the decision to the Subdivision and Development Appeal Board (SDAB). Also, if the development planner refuses a development permit application, the applicant has the right to appeal to the SDAB. If an applicant files an appeal to a refusal, SDAB notifies nearby property owners and the affected Community League, so they can speak in favour or against the application if they wish. Where the Mature Neighbourhood Overlay, as well as a number of other overlays, applies, the City is required to complete additional engagement with surrounding neighbours when an application would require a variance to the overlay. A development planner may also require consultation in other situations where the public's input might be helpful. Edmonton’s Zoning Bylaw is the "rule book" for all development that occurs within the city. It sets out the location and size of buildings that can be constructed on private property, and the types of activities that can take place on those properties. The current Zoning Bylaw 12800 was adopted by City Council on February 22, 2001 and took effect on June 14, 2001. Urban Planning is a dynamic process as cities grow, evolve and change. As a result, the rules and regulations of Edmonton’s Zoning Bylaw are constantly evolving to help realize our city vision, and meet the needs of communities, applicants and city staff. Amendments to the Zoning Bylaw must be approved by Council at a Public Hearing. Major amendments to the Zoning Bylaw involve significant research and consultation with stakeholders. 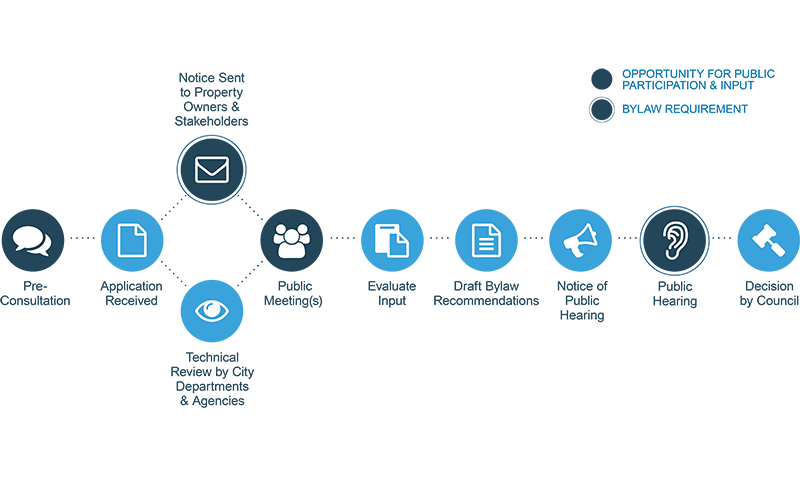 Sustainable Development is committed to providing opportunities for residents to get information and provide their input at a variety of stages in the amendment process before proceeding to Public Hearing. View Current Zoning Bylaw Text Amendment projects and ways to get involved.